BioMed Research International, 2018, Article ID 1023490. Acalabrutinib (ACP-196) purchased from Selleck. 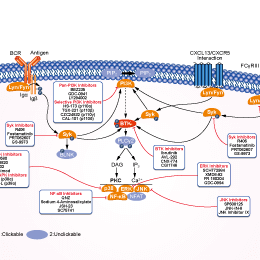 In the in vitro signaling assay on primary human CLL cells, acalabrutinib inhibits tyrosine phosphorylation of downstream targets of ERK, IKB, and AKT. Acalabrutinib demonstrates higher selectivity for BTK with IC50 determinations on nine kinases with a cysteine residue in the same position as BTK. Importantly, unlike ibrutinib, acalabrutinib does not inhibit EGFR, ITK, or TEC. 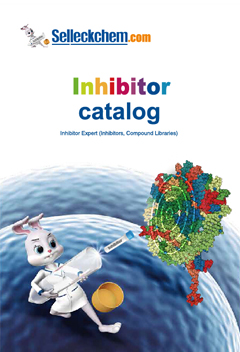 acalabrutinib has no effect on EGFR phosphorylation on tyrosine residues Y1068 and Y1173. Compared with ibrutinib, acalabrutinib has much higher IC50(>1000 nM) or virtually no inhibition on kinase activities of ITK, EGFR, ERBB2, ERBB4, JAK3, BLK, FGR, FYN, HCK, LCK, LYN, SRC, and YES1. oral administration of ACP-196 in mice results in dose-dependent inhibition of anti-IgM-induced CD86 expression in CD19+ splenocytes with an ED50 of 0.34 mg/kg compared to 0.91 mg/kg for ibrutinib. A similar model is used to compare the duration of Btk inhibition after a single oral dose of 25 mg/kg. ACP-196 inhibits CD86 expression >90% at 3h postdose. Dosages: 2.5, 5, 10 mg/kg. Wu J, et al. J Hematol Oncol. 2016, 9:21. Heather L. Gardner, et al .Cancer Res. 2014, 74(19 Supplement):1744. Todd Covey, et al. Cancer Res. 2015, 75 (15 Supplement):2596.